IDB's investment focuses strategically on the transportation sector in preparation for the 2014 World Cup. Photo by Paulo Fehlauer. A version of this post was originally published by Maria Fernanda Cavalcanti in Portuguese onTheCityFix Brasil on July 1, 2011. Brazil recently announced a financial partnership with Japan that involves a contract of up to $3 billion to be invested in infrastructure projects, with a focus on the transportation sector. The partnership is between Banco Nacional de Desenvolvimento Economico e Social (BNDES), the largest source of financing for development projects in Latin America and the Caribbean, and the Japan Bank for International Cooperation (JBIC), which promotes projects that preserve the global environment, such as preventing global warming. 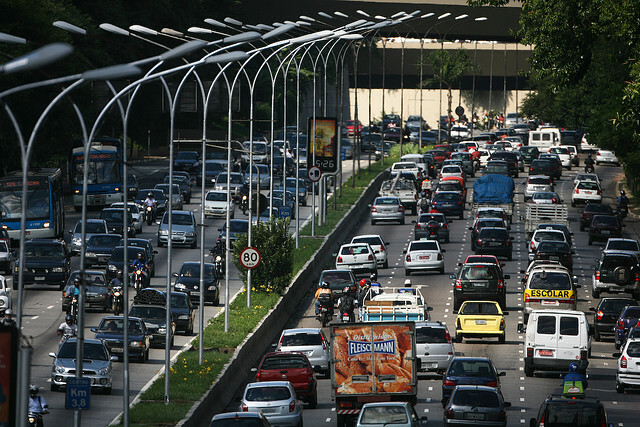 Last week, Brazil received more good news for its booming transport industry. President Rousseff renegotiated a loan of up to $12 billion from the Inter-American Development Bank (IDB) to finance social change and urban mobility in Brazilian cities by 2014. IDB President Luis Alberto Moreno said the bank will lend $10 billion to $12 billion to Brazil over the next four years. By the end of 2011, the stipulated credit will be $2 billion. The goal of the negotiation is to support the social services provided through the Brazil without Poverty Plan, a project to elevate income and living conditions for extremely poor families. Part of the IDB agreement focuses specifically on infrastructure improvement projects in preparation for the 2014 World Cup . The plan is to provide financial assistance to the 12 host cities to complete urban mobility projects in order to move people in a more efficient and sustainable manner. To accomplish this, the plan will provide funds for the construction of roads that connect South American countries, supplemented with bike lanes and new bus lines to relieve congestion. In total, the plan will invest about $6 billion for the completion of the work. Directing investments toward mobility projects could be beneficial to Brazil long after the World Cup. But investments for such large-scale events in the name of infrastructure improvement should be approached with caution. Instead of focusing solely on temporary stadiums, investments should be directed to permanent infrastructure that will serve cities even after the main event has passed. Greece, for example, spiraled into debt after the 2004 Olympics. Granted, Greece hosted the most expensive modern Olympics in the event’s 100-year history, which was due partly to security concerns, but the overwhelming economic burden of the event is undeniable. The Greek Olympics cost somewhere near 6.5 billion Euros, or 4 percent of Greek GDP, nearly 50 percent above the original budget, explains Simon Nixon in an interview with Money Week. Nations seek large-scale events like the World Cup and the Olympics for the “Barcelona Effect,” a rise in inward investment and a surge in tourism, similar to the one that followed the 1992 Barcelona Games. What they should be cautious of is the “Montreal Effect,” where Montreal raised tax rates after its 1976 Summer Olympic Games in order to pay off the costs of hosting the event. Even then, it took Montreal until 2006 to pay off all of its debts. Most recently, Brazil’s 12-month deficit has seen a rise from $48.92 billion to $50.96 billion, 2.29 percent of the GDP, all while the country is experiencing a decrease in foreign direct investment, reports the Wall Street Journal. Currently, Brazil is the largest customer of IDB, which has supported 226 projects. According to the bank, all works are monitored and receive audits. Vancouver Winter Olympics: Winning a Gold for Transportation?